I began tying cinches in 2006 when I needed a camp hobby. My husband and I lived in Cow Camps 9 months of the year without electricity and some didn't even have running water. After doing our riding in the morning and starting our colts in the afternoon, I read every book we owned. Twice. I was bored and there really isn't much you can do in a remote Cow Camp, especially without silly things like electricity! A friend gave me a crude cinch board and a 2 hour crash course on cinch tying and I was off and running. Now, we have two little boys that keep us on our toes. I work for the ranch where my husband is employed, blog, write for a couple of local publications, and teach Animal Science at Great Basin College. We don't have a camp job anymore, but I am still tying cinches. To date I have been featured in the Western Horseman magazine, and teach workshops on tying cinches. I estimate that I have tied close to 500 cinches this far. 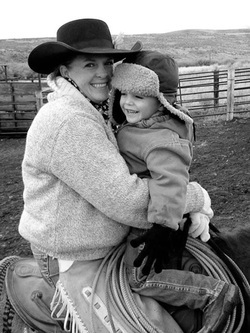 If you would like to learn more about me and my adventures with my little cowboy family, please follow my blog "The Rambling Ranch Wife."